Since the Windows 8.1 Update 1, the OS can detect if you’re running it on a traditional desktop with keyboard and mouse, or one with a touch interface. Since the Windows 8.1 Update 1, the OS can detect if you’re running it on a traditional desktop with keyboard and mouse, or one with a touch interface. If you’re running it on a traditional computer, it will automatically boot to the desktop, and not the Start screen. No more hunting down options or installing third-party software. This was a good move by Microsoft as the company has made Windows 8.1 easier to use for traditional desktop users. However, some of you might like to use the Modern UI and would rather have Windows boot to the Start screen like it did before the update. If you’re one of those folks, here’s a look at how to make it boot the way it used to. Making Windows 8.1 with Update 1 boot to the Start screen instead of the desktop is a simple process. Right-click on the taskbar and select Properties. 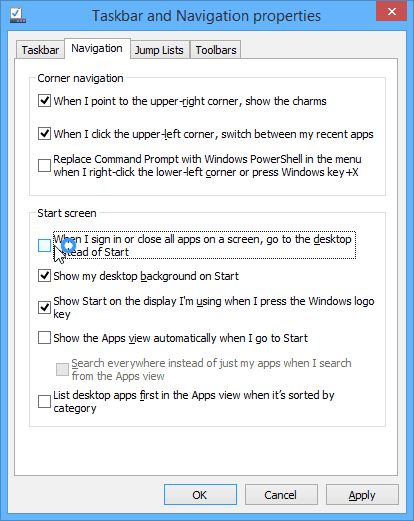 Then select the Navigation tab, and under Start Screen, uncheck “When I sign in or close all apps on the screen, go to the desktop instead of Start” and click OK.
Now the next time you reboot your computer, it will go directly to the Start screen with all of your Modern apps. Personally, I wouldn’t set this feature on my desktop computer or laptop. But it’s a nice feature if you’d rather live to see your live tiles first. During Windows 8, we covered different ways you can boot directly to the desktop. From installing third-party utilities like free Classic Shell or Start8 from Stardock (which also gives you a Start menu). We’ve shown you how to do it with other system tweaks such as using Task Scheduler. With Windows 8.1 you could do it by simply checking a box in Navigation Properties. Now with the 8.1 Update, Windows can automatically detect if you’re computer is traditional or includes a touch screen. Instead of getting the Modern UI shoved down your throat, It’s Microsoft has finally (after three updates) got the OS where the majority of consumers would like to be – at least with the boot to desktop part. my Numlock in start up is off. i changed my initial keyboard indicator registry to 2 in registry editor but i still have this problem!!! I took the time to set up start with News, Fun Stuff, Desktop Apps, ETC. When I log in to a win7 machine it just seems clunky. You can even have all the desktop apps show up first if that’s all you use. What is the problem? Thanks for the tip! I wish Microsoft had given us the choice of the older type start menu and ‘Metro’ I use desktop computer and due to my sight issues I found it a lot easier to use a vertical start menu as in Windows 7 than the horizontal tiles in Metro. I wish Microsoft would listen to it’s customers who have been loyal for decades. I’ve been a fan of Windows since Windows 3.1 and now on Windows 8 pro on all my computers. I use Classic shell as I find it easier but trying to get use to the Metro Start Menu. Surely the coding for the old type start menu is not that difficult for the experts at Microsoft and to put back in Windows 8/8.1 as a choice. I reckon they’d get more brownie points if they were to reinstate it. Apart from that Gripe I like Windows 8.1 and it’s far more stable and secure than even Windows 7. I use several dual boot computers and even dear old XP, disconnected from the internet of course, as some of my old music apps won’t run on Windows 7 or 8.1. They won’t even fun correctly in a virtual box either and I need those music apps. I prefer to boot into Metro UI, since I’ve installed Windows 8.1 on a desktop I built to use as a HTPC (and for minor gaming too, I included the HD 6950). Hence using live tiles is more ideal when viewing it on a TV from a far distance. I also have a XBOX 360 controller which can control live tiles via XBStart, hence booting into Metro UI when hooked up to a TV is the way forward.